FoldableÂ 20l /40L solar outdoor hiking Camping bathing Washing Shower Bag, which is made of PVC material, includes flexible delivery hose, nozzle with tap and hooked rope to attach to a tree branch. 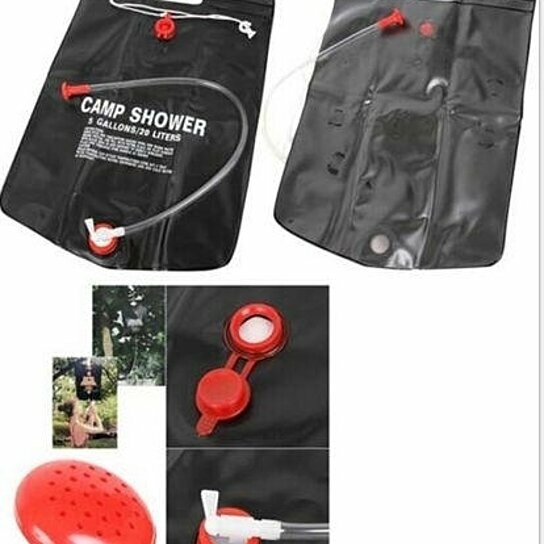 This camping shower bag can keep you cleaning while camping or hiking and it was made of non-toxic PVC materials. It doesn't leak anytime. The waterflow is controlled by a pull on/off shower spout with large capacity of 20l/ 40L and well performance on heating absorbility. Natural hot water can be obtained by keeping either front or back surface exposed to the direct sunlight. It makes you more enjoyable to take a warm shower after a long expedition. This shower bag can fold away for easy storage. 1. Rinse the shower bag with warm water before initial use. 3. Maximum temperature should be attained in approximately 3 hours; it can make the 15 degrees water reach about 45 degrees. 2. Please don't heat the water over 48 degrees, or it will shorten the service life of bag. 4. If you don't need to use it,please dry it.